(May 29, 2018)—AFI research has uncovered a growing body of evidence proving that courtiers from Queen Elizabeth's Privy Council, if not the Queen herself, certainly cooperate, and may actually direct the Spy-gate operation against President Donald Trump, and not Putin. One courtier in particular stands out: The Right Honorable Sir Geoffrey Edwin Pattie, privy counselor for intelligence, defense and mind control (propaganda). Sir Geoffrey's published biographies are themselves chock full of propaganda, misdirection and glaring omissions. So, we started digging and found way too many omissions to be inadvertent. This excellent interview discusses the contents of this post. We suggest you listen as you read this post clear to the end. Headlines With A Voice has produced these powerful videos reviewing the informaiton in this post. Click the bookmarks to the videos embedded at the end of this post. Exposé of another Privy Council Election Rigger: Sir Lord Baron George Mark Malloch-Brown. Sir Geoffrey never discloses his central role in the founding of Serco Group Plc (1986) when he was Minister of Industry and Trade. 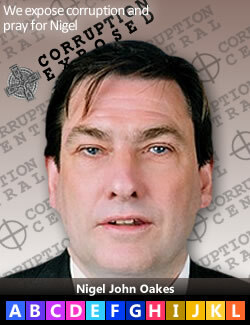 Never mind that he allowed RCA to change its name to Serco Limited several months earlier. This appears to have been intentional to confuse the public about Serco's real mission—weaponize the Internet and communications. Sir Geoffrey never discloses that as Minister of Industry and Trade, he was personally responsible for managing all of the Crown's "golden shares" in every industry. This gave him enormous influence around the world. With such knowledge, he should never have been allowed to start private companies later to trade on this knowledge and enrich himself and his friends. He did, in spades. Sir Geoffrey has used his inside knowledge to enrich himself, and to weaponize the Internet in exactly the same way his Senior Executive Service (SES) collaborators have done in the U.S. This weaponization included the theft of Leader Technologies scalable social networking invention. Leader's invention was as a linch pin technology needed by Sir Geoffrey and the Deep State to control societies around the planet through propaganda, psyops and "mind bending." In fact, one group of his companies under the rubric of "SCL Social" don't even hide their reliance on Leader Technologies' invention. Sir Geoffrey never discloses First Defence, a defense and security "think tank" he founded in 2002 (not a misspelling, the British spell Defense with a "c"). He used First Defence to press for the weaponization of the Internet through Serco, OPIC, Crown Agents, Rio Tinto, USAID, Gates Foundation in evident cooperation with his U.S. counterparts at the Highlands Group. What we are just awaking to is that this weaponization of the Internet includes euthanasia (U.N. Agenda 21 population control) by deploying 24,000 totally unnecessary 5G milliwave WiFi satellites that have the power to permanently alter a person's mental state and kill them at higher wattages. See also Crown Agents USA conspiracies described in their own words. Sir Geoffrey never discloses that he was deeply involved in leading the Intellectual Property Institute, previously named "The Common Law Institute of Intellectual Property Limited" formed on Apr. 22, 1981. From 1983, when he was Minister of State (Ministry of Defence) (Procurement), he exerted great influence over intellectual property policy, first for the government, then for the Queen's Privy Council. The public has been led to believe that he was only chairman between 1994-1999. Why is this critical? This means that the British patent, copyright and trademark system has been a military intelligence psychological operation and property theft ring in Britain for almost forty years. It is also significant since Serco, the company Sir Geoffrey formed in 1986 when he was Minister of Industry & Trade (and the keeper of the Queen's Golden Shares) now RUNS the U.S. Patent Office. This is proof positive that the U.S. Patent Office has been turned over to Sir Geoffrey E. Pattie, the Queen's Privy Council and British intelligence. Serco was awarded its first USPTO contract by Obama's USPTO director David J. Kappos. Note that Leader Technologies' patent attorney, law professor James P. Chandler III, had started a parallel organization in the U.S. named the "National Intellectual Property Law Institute (NIPLI)." 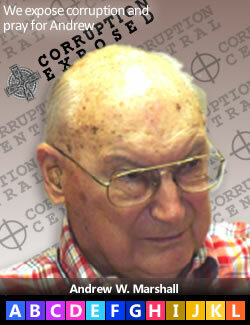 Chandler used this institute under Bill Clinton to coordinate with the DoD Office of Net Assessment (longtime SES member Andrew W. Marshall). These American warlords were evidently planning to eviscerate American property and privacy laws (like Sir Geoffrey had already done in Britain) in a globalist attempt to destroy national sovereignties in Washington, D.C. and around the world. Chandler was responsible for getting IBM's longtime inside intellectual property counsel David J. Kappos appointed by Barack Obama as director of the U.S. Patent Office on Aug. 07, 2009. Kappos sold all his IBM stock and put most of his $1+ million investment chips in Vanguard stocks. Tellingly, these criminals were so worried about their exposure in the theft of Leader Technologies' social networking patent, that Kappos invoked dormant procedural rules to declare the patent invalid in a secret administrative procedure for which even FOIA's were denied. Such thefts of property by SES bureaucrats are fraudulent and illegal. Fig. 4—David J. Kappos. (2012). S. Prt. 112-NN. (Nov. 12, 2012), p. 34, Plum Book, [Senior Executive Service (SES)] Policy and Supporting Positions. Committee on Homeland Security and Governmental Affairs. U.S. Senate, 110th Congress, 2d Session. Y 4.P 84/10:P 75/. GPO. When nominees come before the Senate Judiciary Committee, they must submit special affidavits called a "Statement" that provide ethics disclosure so the public can assess their potential conflicts of interest. The statement cannot contain frauds or material omissions. Kappos told the Senate that he was "IBM's chief IP lawyer." David J. Kappos boasted to the Senate in 2009 that he was IBM's top internal IP counsel. His mentor, James P. Chandler, III, was top outside IP counsel, as he boasted widely. Fig. 5—S. Hrg. 111-695, Pt. 3. (Jul. 29, 2009). Statement of David J. Kappos at Confirmation Hearing to be Director of the U.S. Patent Office. U.S. Senate Judiciary Committee, p. 100. GPO (42.2 MB). 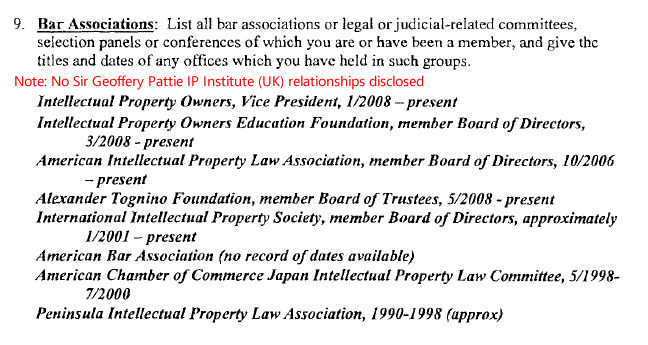 Nowhere did Kappos disclose a relationship with Britain's top intellectual property law institute. He also did not disclose his close and long time advisory relationship to James P. Chandler, III and Chandler's National Intellectual Property Law Institute (NIPLI) in Washington, D.C. These are two GLARING omissions. Fig. 6—S. Hrg. 111-695, Pt. 3. (Jul. 29, 2009). Statement of David J. Kappos at Confirmation Hearing to be Director of the U.S. Patent Office. U.S. Senate Judiciary Committee, p. 89. GPO (42.2 MB). Fig. 7—S. Hrg. 111-695, Pt. 3. (Jul. 29, 2009). Statement of David J. Kappos at Confirmation Hearing to be Director of the U.S. Patent Office. U.S. Senate Judiciary Committee, p. 91. GPO (42.2 MB). 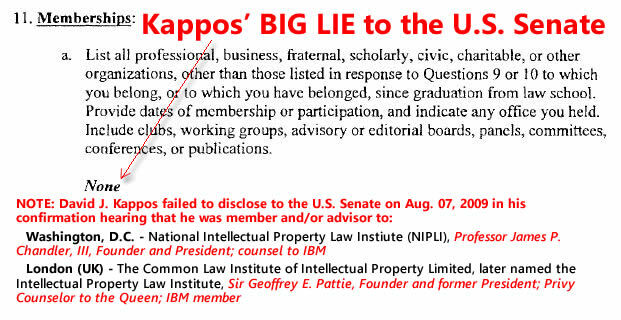 Kappos clearly hid from the Senate his IBM relationship to Sir Geoffrey and his IP Institute. IBM had joined the Institute on Mar. 31, 2006 (Fig. 6)—three years before this Senate confirmation hearing where he failed to disclose the membership. The Institute had welcomed Microsoft and Wilmer Hale LLP a year earlier. Wilmer Hale LLP is Robert S. Mueller, III's law firm running the Trump-Russia witch hunt. Fig. 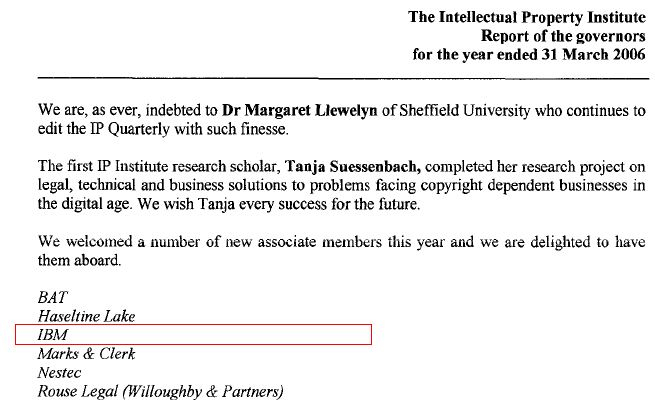 8—The Intellectual Property Institute, Co. No. 01557489. (Mar. 31, 2006). Report and Accounts, incl. new members IBM David J. Kappos), BAT, p. 8. Companies House. Fig. 9—Sir Geoffrey E. Pattie's signature as chairman on Full accounts made up to 31 March 1997 for the Intellectual Property Institute, Co. No. 1557489, Charity No. 283150. Link to follow. The following Serco press release headline confirms that David J. Kappos, while director of the U.S. Patent Office, was secretly conspiring with Sir Geoffrey E. Pattie, Serco and the Queen's Privy Council to undermine the American patent system. Fig. 10—Press Release. (Mar. 19, 2013). Serco Processes 2 Millionth Patent Application for U.S. Patent and Trademark Office. Serco. This was published during David J. Kappos tenure as Director of the U.S. Patent and Trademark Office under Barack Obama. In July 2005, Leica, Leica Micrososystems, and various divisions of Sir Geoffrey's former GEC Marconi companies, sold to U.S. conglomerate Danaher Corporation. Danaher has significant relationships with Mitt Romney's Bain Capital. (Note: Bain Capital now owns the QRS-11, 14 uninterruptible autopilot device, once controlled by Hillary Clinton and Rose Law Firm, that can crash planes and target powerful electromagnetic waves to your brain.) Danaher focuses Leica on toxicology and forensic science (pathology), among other things. Leica Geosystems specializes in mapping and surveillance cameras in space (spy equipment). Given Serco Group Plc's pathology company in the UK—VIAPATH Group LLP, Sir Geoffrey's hiding of Leica and its emphasis on pathology, as well as geospatial satellite technologies, by the Crown, is concerning. Queen consort Prince Philip, Duke of Edinburgh has famously said about world population: "In the event that I am reincarnated, I would like to return as a deadly virus, in order to contribute something to solve overpopulation." Looks like Prince Philip may deserve a rat's existence in his next life instead. Could Sir Geoffrey be facilitating Prince Philip's depopulation wish via 5G? 24,000 satellites raining down 5G could wipe out whole geographic regions at a time. See As Obama Fiddles, British Plan Wars and Genocide (EIR Int'l, 2010). See also Prince Philip in his own words on the need to 'cull' the world population. Intentionally or not, Sir Geoffrey's Leica companies are helping fulfill Prince Philip's depopulation dream via the new 5G milliwave killer satellites being launched by Elon Musk's SpaceX, OneWeb (Amazon, Qualcomm) and IBM. Prince Philip's "deadly virus" will be digital, electromagnetic and delivered via 5G killer WiFi. Oddly, Sir Geoffrey never discloses his mother's name, not even in Burke's Peerage. We know the names of his dental surgeon father, Alfred Edwin Pattie. His wife's name is Tuëma Caroline Eyre-Maunsell. He has two children, son Andrew Edwin Charles Pattie, and daughter Jessica Tuëma Pattie. We know Sir Geoffrey was born on the south coast of England in Hove, Sussex to a mother whose last name in the birth registry simply shows the surname "Carr." Add this odd nondisclosure to Sir Geoffrey's long list. We don't know who the Queen's Warlord is, really. 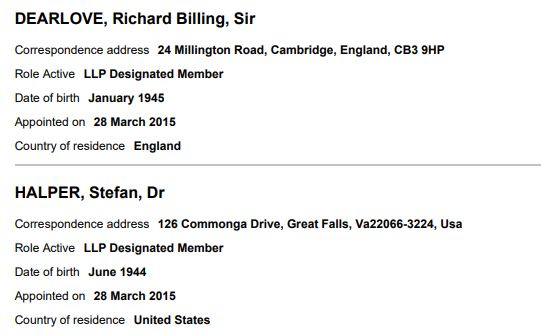 Christopher Steele, Sir Richard Dearlove (MI6 until 2004), and Stefan Halper (MI6, C.I.A.) will have taken their marching orders from Sir Geoffrey Pattie—the Queen's Privy Counselor for intelligence, propaganda and defense. Sir Pattie is evidently conspiring with his American intelligence cohorts John O. Brennan (C.I.A.) and James R. Clapper (NSA, DNI) as they in concert, pushed forward the "dirty dossier" together with FBI director James Comey, Robert Meuller, James Chandler, Gilman Louie, Andrew Marshall, Eric Holder, Loretta Lynch, Valeri Jarrett, Mark Zuckerberg, Sheryl Sandberg, the DNC, John Podesta, Robby Mook, RINO Republican Never Trumpers, John McCain, Carnegie Mellon Corp, Mitch McConnell, Mitt Romney, Duval Patrick, Hillary Clinton, Debbie Wasserman-Shultz, Andrew McCabe, Bill Priestap, Peter Strzok, Lisa Page, Eric Schmidt, Jeff Bezos, Susan Rice, and most assuredly, Barack Hussein Obama. The formal spy business is totally hierarchical. Spies follow orders from superiors. The propaganda that they are crazy and often times go rogue is meant to frighten the public. 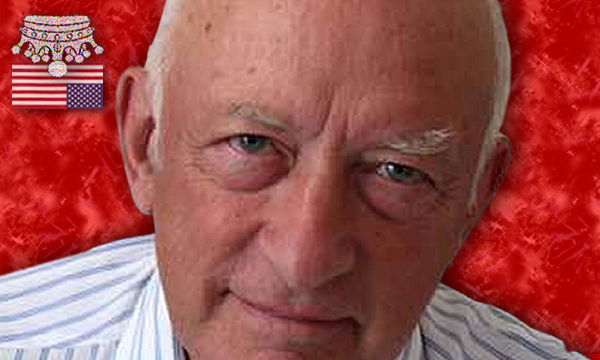 Clearly, if the Queen or Prince Philip did not order the anti-Trump action (which cannot be ruled out without hearing from her directly), then Christopher Steele was ordered to attack Donald Trump by the Queen's Privy Counselor Sir Geoffrey E. Pattie, her resident intelligence, defence and mind control expert. Second, the Department of Justice has jealously guarded the identity of their FBI provocateur inside the Trump campaign, which is now almost certainly Stefan Halper. Halper lured the wet-behind-the-ears spy neophytes Carter Page and George Popadopolous into being assets in order to embed them in the Trump campaign and gather intelligence. But, assets for who? It doesn't matter. Either way, the Deep State is caught with hard evidence of their trans-Atlantic treachery. Cambridge Analytica C.I.A. MKUltra "mind-bending for political purposes"
Third, anti-Trump hysteria triggered the MSM to breathlessly accuse Brad Parscales—incoming Trump 2020 campaign manager—with impropriety in purchasing 270,000 Facebook accounts from a third party who had purchased them from the British "data mining" firm Cambridge Analytica. Never mind that all political campaigns buy such lists to farm for likely voters. Senator Ted Cruz bought lists from the company also. He also facilitated the union of Lockheed and British Nuclear Fuels Plc with Serco by using the Golden Share to form AWE Management Plc. The Golden Shares were being worked hard in this deal, which was tied closely to the Queen's uranium holdings in Rio Tinto Plc and URENCO in the U.S.
At a London trade show in 2005, Sir Geoffrey's CEO, Nigel J. Oakes boasted to The Guardian (Sep. 10, 2005) that they were in the business of "mind-bending for political purposes" and that Sir Geoffrey's group was "The first private company to provide psychological warfare services, or 'psyops', to the military." Dr. Paul G. Kaminski received a dubious ISSA's award given only to warmongers like Alexander Haig and Casper Weinberger. Just months earlier, Chandler had agreed to become the intellectual property lawyer for innovator Leader Technologies from Columbus, Ohio. Just 12 days before his meeting with his British intellectual property counterpart Sir Geoffrey, on Jun. 8, 2000, James P. Chandler, III had attended a product design meeting at Leader Technologies in Columbus, Ohio where he learned critical details about their grounding-breaking social networking invention. See Leader Technologies files trillion dollar bond lien on the U.S. government disclosing more about Chandler's treachery. Without Leader's permission, Chandler was evidently scheming with Sir Geoffrey, his fellow war lord, on how to steal Leader's invention to speed up their Internet weaponization plans. Fig. 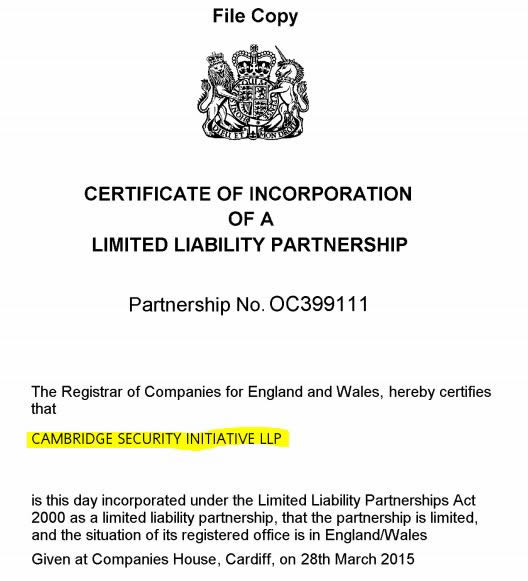 11—Cambridge Security Initiative LLP, Co. No. OC399111. (Mar. 28, 2015). Certificate of Incorporation and other records. Companies House. Fig. 12—Cambridge Security Initiative LLP, Co. No. OC399111. (Mar. 28, 2015). Certificate of Incorporation and other records. Companies House. This evidence alone is indictable evidence of Stefan Halper's treason, not to mention his many co-conspirators in the "dirty dossier"
The evidence clearly shows that Sir Geoffrey Pattie and his rogue C.I.A. friends in the U.K. and U.S. actually directed Stefan Halper's efforts to recruit and direct the infiltration of the Trump campaign. They did it with the help of former British ambassador to Russia, Sir Andrew Wood, and Maltese academic Joseph Misfud. These men co opted the intelligence neophytes Carter Page and George Popadopolous to run around fabricating the “dirty dossier” in a roguish "pee pee" effort to unseat a duly elected U.S. president. It is now well established that Sir Richard Dearlove, head of MI6 until 2004, worked closely with his C.I.A. counterpart, John P. Brennan. The Queen's Privy Council was evidently involved, if not the Queen herself. The story gets tedious from here, but Halper was clearly directing the anti-Trump takedown attempt for The Privy Council's Sir Geoffrey and his MI6 subordinate Sir Richard. Indeed, Halper was simultaneously being paid by Sir Richard (British MI5) for Cambridge Security Initiative programs all the while he was being paid over $1 million by the SES through the DoD Office of Net Assessment's Andrew W. Marshall. It appears that the Queen’s Privy Council goal was to derail Donald Trump’s candidacy, including his influence on Brexit in Europe, and mask their exposure in Bill and Hillary Clinton's Uranium One scandal involving the Crown's Golden Share trans-Atlantic control over Serco, Crown Agents, AWE Management, Lockheed Martin, SES, OPIC, MMC and URENCO, among others. As stated earlier, on Jun. 20, 2000, Sir Geoffrey received an ISSA silver medal award that includes fellow medallist Dr. Paul Kaminski. Just nine months before Sir Geoffrey's award, Kaminski helped start In-Q-Tel for the C.I.A. The evidence shows that America is not leading the Five Eyes alliance, but somehow Britain and the rest of the Commonwealth are, or at least they are when the rogue C.I.A. wants an excuse to act unconstitutionally. Sir Geoffrey's Companies "Without Borders"
Sir Geoffrey has literally hundreds of conflicts which require public disclosure, but have been hidden. Tellingly, one of his undisclosed relationships is with Global Strategy Limited and its director Graham Roy Barr. Barr is also a director in a string of Bell Pottinger entities which he identifies as "Bell Pottinger Sans Frontieres" which means "Bell Pottinger Without Borders" in French. The following table provides judicially-recognizable evidence of Sir Geoffrey's hundreds, if not thousands, of intertwined conflicting, and probably all illegal relationships on behalf of the Queen's Privy Council. It contains hard evidence of astounding conspiracies, money laundering, tax evasion, psyops, "mind-bending" brain washing, election rigging, and probably numerous insightments to war, insurrection, murder and death on mass scales. Most of these relationships have been totally hidden from the public. Now that these relationships are public, they can be used to disqualify these individual and entities from any involvement in any government and business that involves even one of the other names identified. For example, the recent bankruptcy suits In re. SCL USA Inc. and In re. Cambridge Analytica LLC verify over 200 relationships alone that are now in conflict, including Rod Rosenstein, Gibson Dunn LLP, White & Case LLP, Department of Justice, Department of State, Federal Election Commission, Federal Trade Commission, Wells Fargo, JP Morgan, Facebook, Microsoft, Oracle, City National Bank and Verizon. What a mess. See the worksheets for a full list of these names in Sir Geoffrey's biography timeline. Request for More Forensic Investigative Research: We are discovering new organizations and people associated with Sir Geoffrey almost daily basis. We believe there are more relationship connections to be added to this table. Kindly forward those updates to the research team at American Intelligence Media who will forward them to us. For example, some of these entities are just now declaring bankruptcy, forcing the courts to assign third party receivers. While it is possible corrupt auditors will be assigned, it is also equally possible the auditors will be forced in any event to report the basics, like the names of the shareholders (co-conspirators), creditors and debtors (possible co-conspirators) and their actual financial holdings, unlike the whitewashed reports they have filed with Companies House. For example, just last month the receiver in the bankruptcy of Bell Pottinger (Services) Limited disclosed American-South African socialite Heather Kerzner as a principal investor who participated in the vicious anti-white smear campaign currently broiling in South Africa. With her money, Bell Pottinger developed the brainwashing slogans “Existence of economic apartheid” and “White monopoly capital.” It appears from the creditor list that they used a dubious Israeli Internet services firm "Cyclicom Israel Ltd." to do the dirty work, then did not pay them! See Staff. (Sep. 14, 2017). Bell Pottinger: Former CEO’s fiancée [Heather Kerzner] seeks return of investment in disgraced PR firm. The National World. How many of Sir Geoffrey E. Pattie's Bell Pottinger “PR” people did it take to fabricate race riots and hatred in South Africa? Only 45. This is an example of the havoc that weaponize social media can reek. 42 Leica PLC UK ANTON SCHRAIL, GEOFFREY EDWIN PATTIE, JOHN RICHARD DAVID WAYGOOD, KATHERINE MARY PHILLIPS, MARKUS RAUH, MAXWELL DAVID POCOCK, NEIL SUNDERLAND, ROBERT BRECH, STEPHEN SCHMIDHEINY 1992 - ? 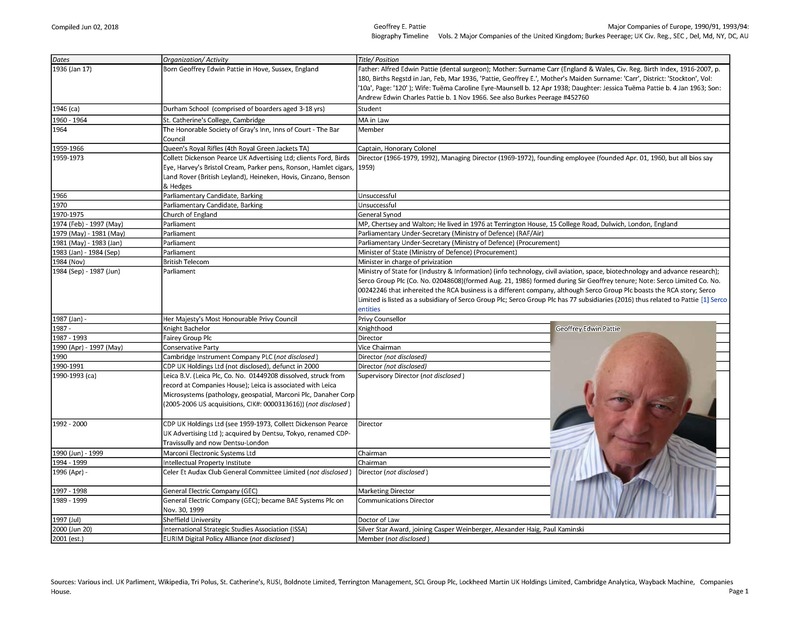 Table 1: Entity relationships that emerged from Sir Geoffrey E. Pattie's business and political activities before and after his appointment to the Queen's Privy Council in Jan. 1987. Sir Geoffrey had and has an ethical obligation to disclose these relationship to the public, but has largely been silent. See Geoffrey Edwin Pattie. (Compiled May 30, 2018). Biography Timeline. (Raw *.xlsx file). Fig. 13—Geoffrey Edwin Pattie. (Compiled May 30, 2018). Biography Timeline. (Raw *.xlsx file). In early 2000, Clinton warlord James P. Chandler, III had just met Michael McKibben and Leader Technologies as a patent attorney. He was shown their Internet innovations under attorney-client confidentiality. Chandler saw that these inventions solved the problem of scalability that was bedeviling his C.I.A., IBM, Microsoft, NSA, DoD, FBI and other Deep State shadow government clients. Lack of scalability in Microsoft and IBM platforms was preventing them from building a global spy grid. Having rebuilt AT&T AccessPlus 3.0 email system in the mid 1990's, McKibben saw the problem, and spent six years inventing the fix. (Now it is know that Sir Geoffrey, Chandler and IBM were also working to get around patriots like William Binney at the NSA.) Unbeknown to Leader, Chandler was the intellectual property kingpin who conceived of and was helping build a global spy network in close cooperation with Sir Geoffrey E. Pattie, the Queen's Privy Counselor for Intelligence, Defense and Propaganda. Hindsight shows that Chandler was probably taking his orders from the Queen's Privy Council. Insiders confirm that Chandler was boasting at the time that he had just been awarded a lucrative trademark account for British American Tobacco Plc (BAT), the largest publicly traded tobacco company in the world with hundreds of trademarks to attend to. The following timeline shows the quid pro quo. Video: Healines with a Voice.